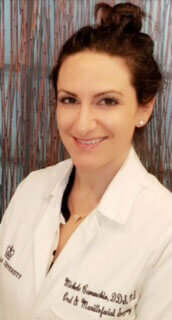 Dr. Michele J. Carunchio is a dual degree Oral and Maxillofacial Surgeon who completed her dental training in 2011 at Columbia University’s College of Dental Medicine in the city of New York. She then remained at Columbia University for the following six years to continue her training in Oral & Maxillofacial Surgery. During her Residency program, Dr. Carunchio obtained her MD degree at Columbia’s College of Physicians & Surgeons, she participated in advanced training in Anesthesiology and completed a 1-year internship in General Surgery at the university’s Medical Center in 2015. Dr. Carunchio joined our team in July 2017 and has been splitting her time between both our Hoboken and Midtown NYC locations. She is a member of the American Association of Oral and Maxillofacial Surgeons and she is Board eligible as recognized by this organization. Dr. Carunchio has a passion for teaching and she she plans to volunteer on staff at Hoboken University Medical Center and her Alma Mater to give back to the Residency program throughout her career. Born and raised in New Jersey and a graduate from Hoboken’s own Stevens Institute of Technology, Dr. Carunchio feels right at home in her new practice setting. Outside of the office, some of her long standing hobbies include cooking, cross country running, latin dance and repairing just about anything that is broken. She is extremely family oriented, loves spending time with her French Bulldog puppy “Meatball,” and she got married to her husband Joel in October. Dr. Carunchio owes her keen attention to detail and her fine hand skills to her late father and mentor in the field, Dr. Michael L .Carunchio, a successful practicing dentist in northern NJ until his passing in 2014.